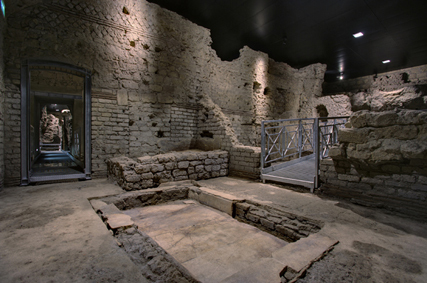 Located under the Basilica is the most ancient phase of the archaeological area of San Lorenzo Maggiore, represented by the V century B.C. Greek agorà. During the Roman period, exploiting the upslope, the square was extended on two levels, up and under via Tribunali: the lower area, destined to commercial activities, and the upper one for political functions. Such disposition dates back to I century A.C. and it maybe follows a more ancient organization. Today we can recognize the macellum, a rectangular porticoed area with workshops and an internal open space with mosaic floors, in the middle opf this area was a tholos, a circular building destined for food selling. In the lower area you can visit small tabernae, a laundry and the treasury. In the V century A.C., the area was covered by layers of alluvial nature. Basilica San Lorenzo Maggiore - Built for will of the Angevine Charles II between the end of the XIII and the beginnings of the XIV century, where once there was an early Christian church, it is an extraordinary example of French gothic style in Naples. Renovated in baroque style in the XVII and in the XVIII century, the nineteenth century restorations brought the Gothic style back. Ferdinando Sanfelice’s façade dates back to 1742 and preserves the original fourteenth century marble portal. The plan is latin-cross with one nave, with a trussed covering and columns to sustain the pointed arches and the side chapels. 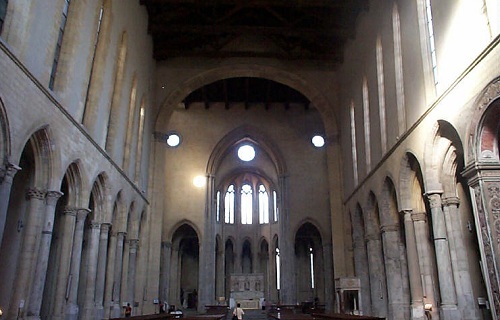 The polygonal apse with cross vaults and radial chapels enlightned by high windows with two or three openings is very interesting. There are also many artworks of great artistic value such as the Sepolcro di Caterina d’Austria with Tino da Camaino’s sculptures (1323) and Cappellone di S. Antonio a baroque work of Cosimo Fanzago (1638). Outside, near the church, there is the fourteenth century belfry and the Friar’s Convent that includes a seventeenth century cloister, the Sala Capitolare frescoed by Luigi Rodriguez (1608) and the refectory.